If someone tells me a book will make me cry, I tend to avoid it. In general, I don’t like sad books, I don’t like “inspirational” books, and I don’t like cheesy, “happy cry” books. Today, I’m going to be a hypocrite and tell you that Everything I Never Told You will make you ugly cry and you should absolutely, 100% read it. When 15-year-old Lydia Lee, favorite child of Marilyn and James Lee, is found dead in the lake across the street from their house, the Lee family is thrown into turmoil. Lydia had been the fulcrum of the Lee family—the person upon whom all her parents’ hopes and dreams rested; the glue that held them all together—and without her, the Lees tumble into chaos. As they try to understand the mysterious circumstances surrounding Lydia’s death, the four remaining Lees come to realize just how important Lydia was to them—perhaps to their detriment as well as to hers. This stunning portrait of love, loss, and longing is one that resonates deeply across all families and cultures, illustrating with devastating clarity the ways we struggle all our lives to understand each other. At first glance, Everything I Never Told You might sound almost like a murder mystery wrapped up in some family drama, and I confess that it was the first line that hooked me: “Lydia is dead. But they don’t know this yet.” (One of my good friends, upon reading the blurb on the back when I gave her this book to borrow, said, “You seem to read a lot of books where people are found dead.” What can I say, I have a type.) But I’m also a sucker for character development, and Everything I Never Told You has that in spades. The narrative style here is interesting; you don’t find a lot of books that are third person omniscient, but Ng pulls it off perfectly. Seeing how Lydia’s death affects each of the Lees, particularly as they reflect on Lydia’s role in their family as well as her role relative to themselves, shows just how much their world truly revolved around her. Getting everyone’s side of the story also gives the reader knowledge that not all the characters have, making it that much more devastating to watch the characters you’ve come to care deeply about make misinformed assumptions and jump to incorrect conclusions while all you can do is groan and pray they find the right path. It goes to show that, no matter how long you live with a person, even if you’re related to them and have known them their whole life (or your whole life), there are some things you can just never know about someone unless they explicitly tell you. Misunderstandings and miscommunications abound from the very beginning of Marilyn and James’ relationship, due in large part to the fact that their relationship is interracial (Marilyn is white, James is Asian) during a time when interracial relationships were still, by and large, unacceptable—and, in some places, illegal. This marriage, of which both society at large (at the time) and Marilyn’s mother disapproved, is the root of all the misunderstandings that later come to be. Though all families have their struggles despite race, religion, or culture, mixed race families in particular face challenges that are difficult for more homogeneous families to understand. The insecurities that both Marilyn and James feel at being a mixed race couple inform each of their assumptions, throughout their marriage, about the other’s thoughts, feelings, and potential regrets. Coming from such different cultures, each with hidden prejudices they didn’t even know they had, created issues from the very beginning that, in general, wouldn’t be a concern for non-mixed families. In the end, Lydia’s death and the mystery surrounding it is secondary; it is the catalyst that sets the true events of the story in motion. But if, like me, you were hooked by the “murder mystery” aspect of this story, don’t let that scare you away. Everything I Never Told You is a story of secrets, of heartbreak, of loss, and of devastation; but it’s also a story of love, of family, of understanding, and most of all, redemption. It’s a book for young adult and adult readers alike; the characters are relatable and real, and Ng has an amazing way of making you feel their pain as acutely as they do. You certainly won’t want to put this one down once you pick it up. 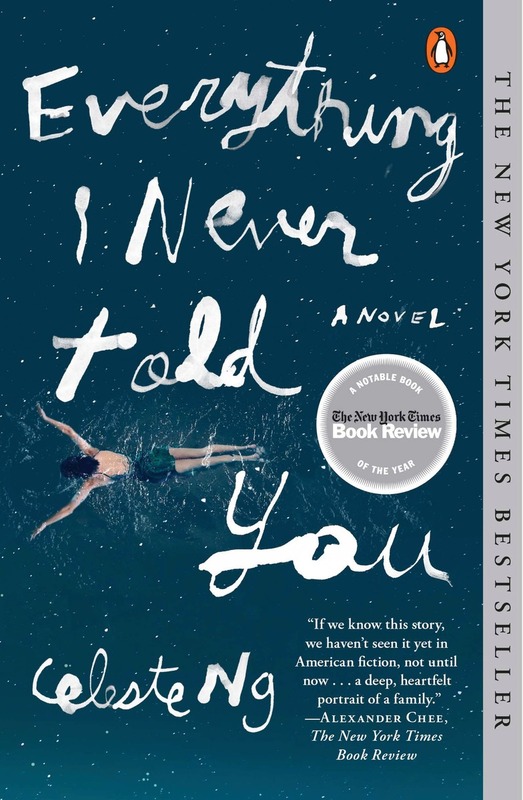 I’m putting my money where my mouth is and giving away a copy of Celeste Ng’s Everything I Never Told You to one lucky reader! Enter using the Rafflecopter widget below or on my Facebook page anytime between now and midnight Sunday. Winner will be announced next Monday! Good luck! Anna, I’ve sent you an email! Please respond ASAP with your address so I can get your book to you! I need this book in my life. I’ve been wanting to read it for so long, but not grabbed a copy yet. If one was to show up in my mailbox though, I would totally drop everything and read! Good luck! 😉 So glad you liked it and want to keep it! People are raving about this book. This is a great giveaway. I came across Ms. Ng on Twitter – sharply intelligent, funny, and a great person to learn from – and I’m excited to see what she’s got going in the print sphere. Huzzah! You won’t regret it! Good luck! You’re welcome 🙂 good luck! It really caught my interest!Plot is amazing so may the odds be in my favor! This book definitely made me ugly cry… I read a library copy but would love to have my own. I’m bummed I missed Celeste Ng when she swung through my city on her book tour. I was so lucky to meet her at BEA! She was a sweetheart. Good luck! Thanks for the giveaway! Happy Summer Reading! I’ve been wanting to read this book for months. I’m glad to see it has receive such great reviews.